It was probably wise to disagree with Girilal Jain. In any case, it was completely unnecessary to agree with him in order to read him. His byline became a magnet for the sheer pleasure of stimulation. He challenged you to think. That was the secret which lay stored in his pen. He dared you with Olympian majesty and, whether dispensing Royism or Advanism, tossed out his formulations with a merciless disregard for sentiment. English journalism in India has its own very specific culture. English newspaper editors take themselves very seriously indeed. They remain far closer to the state than their readers. They are always protecting the interests of the nation, whether or not the nation wants to be protected. Ground level reality is the province of reporters, the more junior the better, Girilal Jain was not above these conceits. But he never forgot the world outside the editor’s room. His ‘republic’ included banias and Jats and Muslims and the myriad ethnic dimensions of India with their hatreds, their casteism, their communalism. Because he recognised it, he was often accused of fostering it. On occasion friends worried about transgression from the first mindset to the other, particularly during the final phase of his long career, when he began to champion a cause totally alien to virtually everything that Girilal Jain had stood for previously. All his life Girilal had championed some cause or the other. He was the opposite of the rebel without a cause syndrome. He was a cause without a rebel case. He began his intellectual career as a Marxist, then turned a passionate Quit India-Gandhian after the Marxists betrayed the freedom movement, evolved into a Royist, migrated towards Indiraism and then, in his last days, reached out for saffron. The problem for his liberal friends of course was his sustained espousal of the Hindutva thesis. Both the thesis and the ardour became problems. But then, Girilal was ardent about everything he believed in. When he used to praise Indira Gandhi he could never find anything wrong with her. Any sorrow was only the misery of the devotee. It was hardly a surprise, therefore, that when he took up the Rashtriya Swayamsevak Sangh view of history and the Bharatiya Janata Party rationale for contemporary politics, he displayed similar ardour. He was after all the BJP’s new Muslim. We have to forgive Girilal Jain his ardour. That was in the nature of the man. But is it equally easy to be generous to a partisan thesis? One answer came obliquely, inadvertently, in a conversation with his friend of five decades, Mr Akhilesh Mithal. The year 1942, said Akhilesh, was Girilal’s finest hour (Akhilesh also believes his friend’s liver problems began with jail food in 1943 and were compounded in more exalted surroundings later, but that is now a secondary matter). What Akhilesh remembered of his friend was Girilal Jain’s passionate idealism, his intense nationalism, qualities which lent an almost luminous glow to his face. That was it. 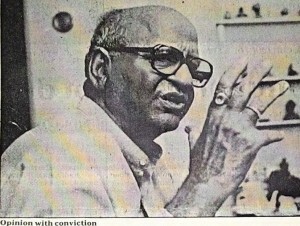 Girilal was the sum total of his ideas and his convictions. Ideas were not simply bread and butter to him, though he made a good enough living out of them eventually. They were the raison d’etre of his very being, the rationale for his existence. He revelled in them like a child discovering fascinating toys or an alchemist striking gold ever so often. As a man who had once responded to Mahatma Gandhi, if not to Gandhianism, Girilal watched the process of nation building as an activist though he opted for journalism rather than politics. He was not a Congressman, but he had sympathy for the great generation of leaders who surrendered their lives to the motherland. His admiration for Indira Gandhi lay in his conviction she had the capability to resurrect India. He had watched, with dismay that grew into anger, the Indian ruling class degenerate through the Sixties leaving cesspools of despair wherever they walked. Mrs Gandhi heralded the Seventies with Bangladesh and a fresh spirit promising the tryst with destiny that had eluded the dying Jawaharlal Nehru. The collapse of the Indira promise, first in the wretched mire of the Emergency and later in the rising violence of Punjab, not only soured the hope, it clearly raised – in Girilal’s mind – troubling questions about the validity of the Congress ideology. He obviously refused to place the entire fault for the collapse at the door of the individuals concerned, from Jawaharlal to Mr VP Singh to Mr Chandra Shekhar. He became convinced the ideology around which India was being reconstructed was a problem, not the solution. He analysed two flaws in the Nehruvian philosophy which has, more or less, remained the anchor of Central governments of every kind till now. Of them “elitism” was the lesser evil. He gradually became convinced that last trap of the British was probably as dangerous as their direct rule: through Nehru and other liberals they had “inflicted” an ideology essentially alien to the land. He came to believe that India would never work as long as this Western millstone of secularism hung around its neck, that the rediscovery of India was essential and the country needed a mindset and political idiom natural to its own genius rather than a polity hammered out on the playing fields of Eton – or Doon School, for that matter. The fact was that the ideas and the ideology that had sustained the Girilal Jain of 1942 for more than four decades were dead, killed by failure and cynicism. 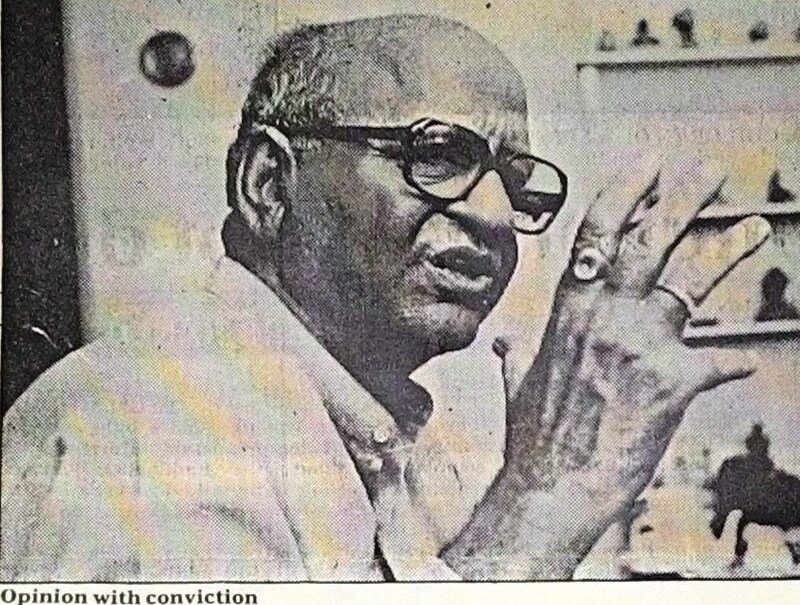 He looked around for an alternative ideology, dismissed the left as equally antithetical to the Indian ethos and selected Hindutva as his preferred answer. You could not expect Girilal Jain to survive without an ideology. That would leave him naked rather than free. The moment the old commitment was dead, he needed a new one. He picked up the only one available. That is a point worth considering. Those who would bury the ideology of the Congress along with the Congress might want to consider what options are on offer. Communism? Ram Manohar Lohia’s high pitched socialism? Acharya Narender Dev’s soft key liberalism? Mr VP Singh’s Mandalism? If the Congress has failed, what else has succeeded? Mr Jyoti Basu’s communism is as distant from Marx as Calcutta from Moscow. In fact it seems it is going to get closer to the rampant capitalism of Beijing than to any social or economic theory propounded in Das Kapital. Mr Basu has succeeded in Bengal by adopting a very Calcutta-specific formulation, unlikely to appeal to a Jain from Haryana even if he were so inclined. It was this combativeness that perhaps prevented Girilal from making more friends than he should have. Moreover, he wanted to be choosy. Certainly he could not suffer fools. He was also a very literal man, in the manner of a determined intellectual, constantly in pursuit of specifics, rarely tempted by imagination. He had no sense of humour though this did not prevent him from laughing at someone else’s wit. Of course he loved his own views which made him, well, a natural editor. He had no particular, fascination for modesty either. He actually did believe, as he said in a famous interview once, that as editor of The Times of India he was the second most important person in Delhi, second only to the prime minister. He was very surprised at the sniggers that ensued. Those who did not like him – and you can include any number of failed but opinionated hacks in that list – called him a windbag. Prejudice. Girilal Jain’s intellectual baggage contained something far more substantial than wind. His last area of inquiry was the 19th century, an understudied and misreported period of India’s past mangled by British historiography. He traced many of our problems to the passions of that time and his continual burrowing mined nugget after nugget. But in a sense that also exposed Girilal’s major limitation, for he never created an argument longer than a newspaper column. Perhaps he liked the comfort of a 1,200 word limit. Or maybe it had simply become an inescapable habit. It is a phenomenon which occurs among journalists. You need a drink after 1,200 words. Girilal however was not the drinking sort. Apart from an occasional indiscretion his personal life was just about as blameless as it can get among the powerful of Bombay and Delhi. He was admired as a professional who kept faith with his pen and his reader. He may have had his fancies but he never had any airs. A first time visitor to his office could be forgiven for wondering whether he was in the right room. The walls were white and blank, and there was nothing to indicate the man with the thickset spectacles sitting across the table had the ear of those who fashioned the affairs of the nation. Girilal did not need a support system to massage his ego. Mr Vartan Gregorian, president of Brown University, once told me of an old Armenian’ saying, “The tongue has no bones”. How true. Which is why it can wander about in any direction. Girilal Jain belonged to a small group of people who are an exception to this rule. His tongue, and his pen, had bones.